Yesterday and today have seen Mother Nature unleashing her nasty side. It has been snowing and blowing here so much that we have snow drifts that are waist high!! Took DH quite a while to shovel us out this morning for our trek into town. Roxy, however was enjoying the massive piles of snow, cause she kept jumping into them face first!! LOL I took this afternoon/evening to stamp, color and create. 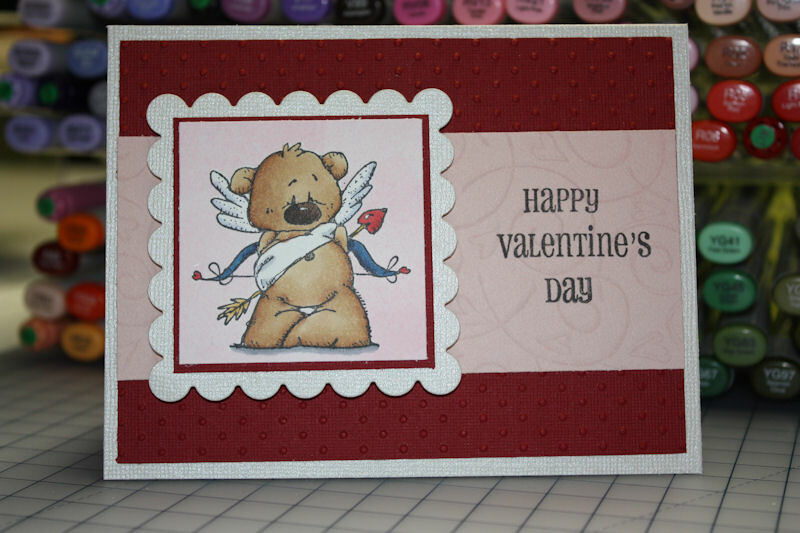 Here is one of the cards I came up with. The picture is not the greatest as I am still experimenting with finding the right light, spot etc. 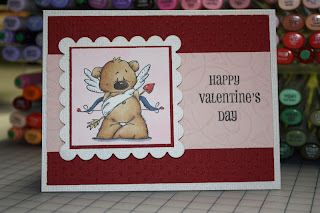 This cupid bear stamp is from Whipper Snapper Designs and is way too cute. I couldn't resist the urge to color him with my Copic markers. Have a good night, stay warm!